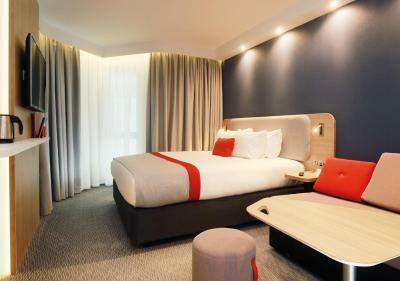 Lock in a great price for Holiday Inn Express Belfast City – rated 8.4 by recent guests! Clean and comfortable. Breakfast options were standard. Location great, very modern. FREE Parking and breakfast a massive plus in Belfast. Value for money compared to many other Belfast hotels. Will 100% stay again. The breakfast was very good and the rooms were nice and big and quiet and comfortable. Excellent hotel! Great location, free parking on site, very comfortable room, nice bathroom, and great breakfast! Breakfast was good, eggs not great, but there were scrambled eggs and bacon, there were also freshly baked croissants and nutella. Coffee was also good. For the money we paid it was great accommodation, free secure parking and good breakfast. Staff were very polite too. Holiday Inn Express Belfast City This rating is a reflection of how the property compares to the industry standard when it comes to price, facilities and services available. It's based on a self-evaluation by the property. Use this rating to help choose your stay! 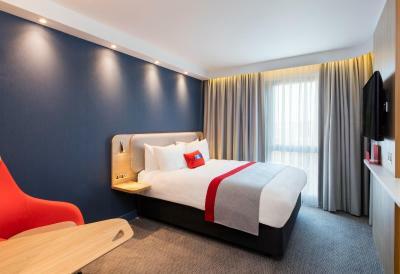 One of our top picks in Belfast.In the center of Belfast’s lively Queen's Quarter, this modern hotel offers stylish rooms with flat-screen TVs and free WiFi access throughout. The restaurants of Botanic Avenue are close by. Free car parking is provided. The hotel is within 20 minutes’ walking distance of the waterfront and city center, with the Belfast Cathedral, shops and many restaurants. 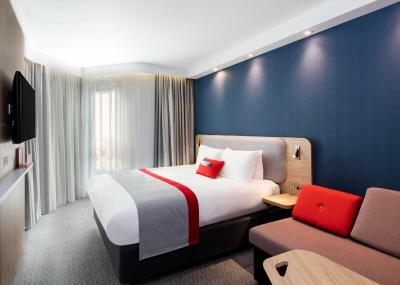 When would you like to stay at Holiday Inn Express Belfast City? 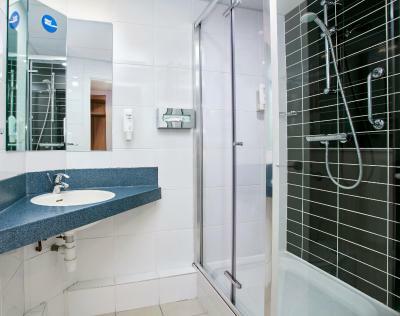 A satellite TV, a seating area and a work area are provided in this room with attached bathroom. Twin Room with an private bathroom. Double Room with wheelchair access and a private bathroom. Double or Twin Room with tea and coffee-making facilities, a TV and a private bathroom. 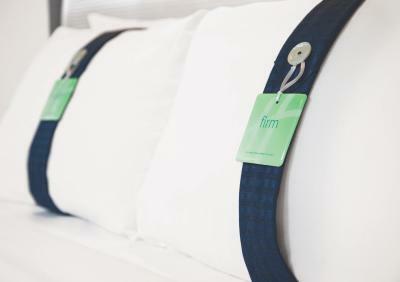 Please request double or twin beds when booking, however the room type cannot be guaranteed. 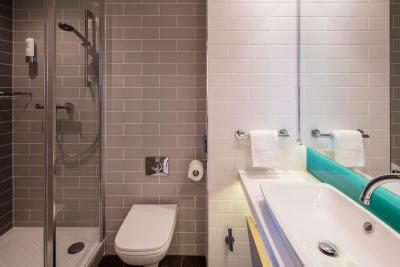 Double Room with a private bathroom and a double sofabed. Room can accommodate 2 adults and 2 children. If sofabed is required for children please state this in the Special Requests box. This double room features a flat-screen TV and electric kettle. House Rules Holiday Inn Express Belfast City takes special requests – add in the next step! Holiday Inn Express Belfast City accepts these cards and reserves the right to temporarily hold an amount prior to arrival. The sofa bed that my children were sleeping on was awful uncomfortable. When the room was unoccupied all day there was a smell of stagnant water in the room on return as if there was a drainage issue. After the first night we went out all day and when we returned the door was not secure, my daughter leaned on it and it opened so after the cleaner had been they had not fully closed the door behind them following this I took any valuables out with me everyday as I didn’t feel that the room was safe. No air conditioning. The rooms were comfortable, the breakfast was very good a good variety to suit tastes and unlimited, The carpark was very secure with a large gated entrance. We toured a lot of the coastal areas during our stay and found this to be a very good base in a central location. It was far enough away from the city center that we were not disturbed. When we got there the room was not a double bed with double sofa bed. We were told Booking.com never advised the hotel of this +2(kids) and they had no other rooms and there was nothing they could do at 9pm at night!!! This got sorted by management very promptly thankfully. Pull out sofa mattress could be better quality, even for kids (light in weight) it wasn't great. Value for money, cleanliness of the whole place, breakfast buffet food was beautiful. Very enjoyable experience. Great location & friendly staff. Very nice clean, freshly refurbished, nice colors, highly recomend. Sofa bed was ridiculous, it’s a single not a double and is lumpy with metal post jutting out on the side, you wouldn’t want your kids sleeping on it for fear of hurting themselves. sofa bed wasn't too comfortable, I was sharing with my child and even then it wasn't great. breakfast was brilliant, plenty of everything. Couldn't fault the room or hotel. the place was spotless and staff were all lovely. ate a meal in the evening and all was good value. Water at breakfast for a cup of tea did not taste nice. It was very nocible. Very little traffic on the street at night. We stayed in a family room. The sofa bed could have been more comfortable. The location was fantastic. Very close to a street with an excellent choice of well-priced restaurants as well as being near the Botanical Gardens and Ulster Museum. Everything was easy and straight forward, the parking, nothing too much trouble for staff, provided a forgotten toothbrush, milk etc. The breakfast was excellent. the evening of saturday april 13th, there was some problem in the kitchen and a chef from an agency was called in. the food was appalling , we like some others waited for over an hour for our meal which came without the full order, it was very poor quality. Waiting staff very kind to our children offering alternatives and drinks. I liked your staff, and we all liked breakfast . the dinning area was very nice and there was plenty of food. staff were very kind to my children on our second night when the kitchen had problems.